I am going through the huge process of organizing my photos and I came across one that I meant to post. Hell, I’ve meant to post a ton of stuff but man have I been busy. I took a trip to the train station a month ago (?) 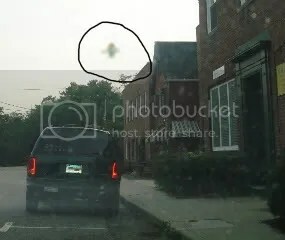 and I noticed at stop lights that there was a fly on my window. Mind you, I think flies are filthy disgusting creatures. Blarf. But there was something different about this little one. While it wasn’t busy barfing on my windshield, it appeared to be going for a ride. When the car slowed to a stop, it would turn its body around so that it was facing the top of the car. As the car sped up, it would turn its body around and hold on for dear life. You could actually see the wind whipping through its little leg hairs. Sure, I thought, that’s cool. See you later. But I got to the train station and picked up my lovely passenger and I pointed out the fly, expecting it to be gone by this point. Nope. So she watched with me as we drove to grab a drink while this little fly continued its dance, flipping back and forth. When we came out to go off to dinner, it was still there! It danced to the the restaurant and by the time we came out it had flown off. But it had spent at least an hour on my windshield. Every time I started driving again, I waited for the force of the air to push it off and it held on tight. What an invigorating experience it must have been for this tiny little thing. How fascinating that at any other time, I might not even have noticed it was there or would have wanted it to move on as quickly as possible. Instead I have a memory of a fly holding on while it whips through the ride of its life.